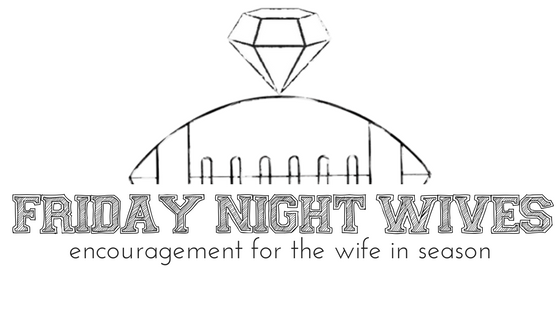 Each week, Friday Night Wives recognizes a coach’s wife by asking her the same five questions. We go through lots of submissions to find entries we think are especially encouraging or insightful. We hope this gives our readers a chance to connect with others’ through their struggles and hardships, as well as learn from someone who has come out on the other side. I am a proud coach’s wife and mother of 3 boys, Ryder (10), Bear (7), and Jase (6). We currently live in Katy, Texas where I grew up and attended high school. I would have never thought, married to a coach, that we would be able to live and coach in my hometown. I teach Motor Skills at the same preschool I attended when I was a little girl. I LOVE my job!!! I also love to workout, bake, go fishing with my boys, and yell and scream like a lunatic at my husband’s football games. Ha! I have been a coach’s wife for 13 years. 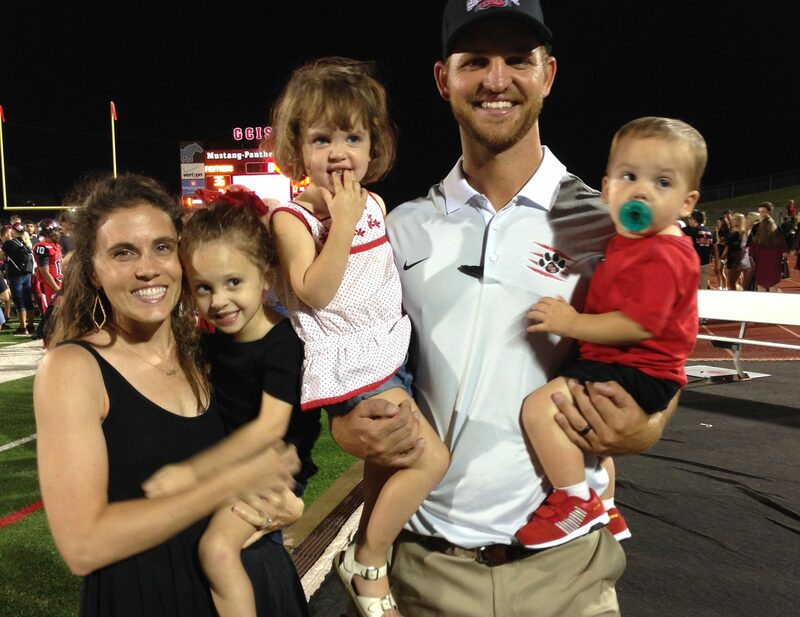 My husband, Charlie, has coached all over Texas from high school to college level including Bay City High School, Cuero High School, Rice University, Texas State University, Odessa Permian High School, University of Texas at San Antonio, University of Houston, Houston Baptist University, and currently at Seven Lakes High School. We have moved SIX times in 13 years!! I have learned to become a minimalist! 3) If you could go back in time and have a conversation with yourself as a first-year coach’s wife, what’s one thing you would tell yourself? One thing I would tell myself as a first-year coach’s wife, is to be INDEPENDENT and BLOOM where you are planted. It’s hard the first year of marriage for your coach because there are SO many hours he spends away from you and the home, and it seems everyone else’s husband is home by 5:00 pm. You can get so wrapped up in feeling sorry for yourself because you eat many dinners alone or attend events by yourself; trust me it gets easier with time. You need to become comfortable with doing things on your own and find hobbies or interests that you can focus on. Find ways to get involved in your local church, plan activities with other coaches’ wives, or dinners out with friends, which will take your mind off the late nights and long hours. Your husband wants to come home to a happy and healthy wife, so you need to work on who you are as a woman. You can also really bloom by becoming a part of his football life. Make every effort to attend games and have a really good excuse if you cannot. There are not many occupations out there that allow the spouse to have a front row view of their husband’s efforts. How cool is that?!? Blooming into motherhood and adding the coaching aspect adds a whole new level of craziness as a coach’s wife. Now you have little people who want your husband to be home just as much as you do. Some of the things I do are take them to practice, to the games, bring dinner up to the office and eat as a family, ride in the car with him to scout a team, go to the recruiting dinners, stay late at the games so you and the kids can give your coach a hug and kiss, despite the win or loss. It takes deliberate steps and time for a flower to bloom. Find ways to bloom where you are planted. I promise you won’t regret it! My balance is God and exercise. I know that is an interesting combination, but it’s what gets me through my day!!! I truly don’t know how I would have survived the tough times we’ve experienced in our football world, if I didn’t have my relationship and prayer life with God. As a coach’s wife, I would experience extremely overwhelming sorrow and defeat. The ONLY thing that allowed me to feel balance and to regain my confidence, is opening my bible and reading the amazing promises of God. How much HE loved me, and He did not give me a spirit of fear, but of power, love, and a sound mind. Reading his word would give me an immediate dose of peace. The coaching world can be unpredictable, so I find my solid ground in my Savior. He is the same yesterday, today, and always. Isn’t that amazing?!? He has a plan for good for those who love Him! The exercise aspect helps clear my mind and feel better about myself. You can’t go wrong with a good workout session! Y’all, I am so blessed because I have an AMAZING mother-in-law who has been a coach’s wife for over 30 years. She has instilled in me so many wonderful words of wisdom I can’t even count. My mother and sister are a wonderful support system for me as well. They let me vent and just LISTEN to me!!! My sister-in-law is also a coach’s wife, and she “gets it”. I have so many fellow coaches’ wives I keep in contact with, although we cheer for different teams now. Fellow coaches’ wives know firsthand what it is like to ride this roller coaster. My advice to a fellow coach’s wife who finds herself in a difficult season, is to surround herself and lean on her tribe. The people who know you the most and understand what it is like in this crazy coaching world are your biggest supporters. They know how to build you up! In my 13 years as a coach’s wife, I still have times I feel like I don’t measure up. But, like my mother always says, “This too will pass,” so I ride out the difficult season because I know God has better days on the horizon, and because of my Savior, Jesus Christ, I measure up!